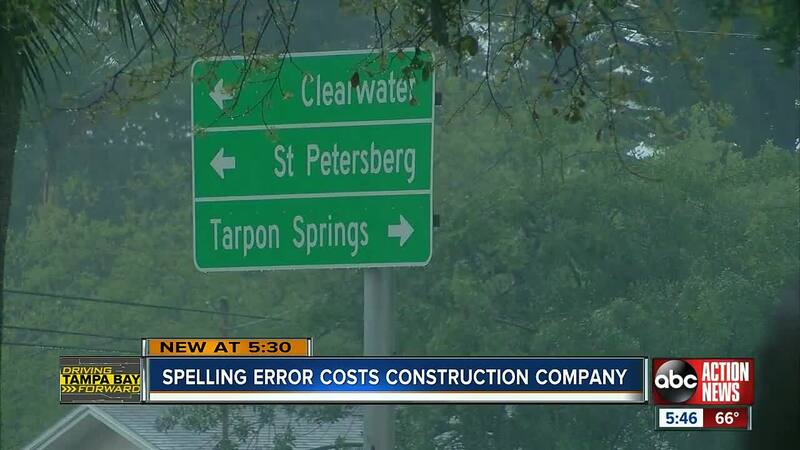 A construction crew spelled St. Petersburg with an "e."
DUNEDIN, Fla. — Thanks to a repaving project the potholes on Curlew Road are gone, but the construction crew left two pesky little eyesores. "That's a bit ridiculous," said business owner Johan Vanzyl. Johan Vanzyl owns Curlew Travel Agency. He has to pass by the sign every day. "It was shocking," he said. He was really shocked when we told him the same mistake is on another sign on the other side of Curlew. That sign is in front of the Publix. "You would think they would check it before they even put it out," said driver Timothy Embry. The Florida Department of Transporation didn't know about the misspelling until ABC Action News called asking questions. Officials immediately sent a crew out to look at the sign Tuesday morning. The workers will put a bag on both signs to cover them until the new signs come in. The the two big questions for taxpayers like Johan: How much is it going to cost? Who is going to pay for it? FDOT could not tell us the price on Tuesday. The spokesperson was able to confirm that the contractor made the mistake. This means they will fix the signs at no charge to the state. The new signs should be up in a week.